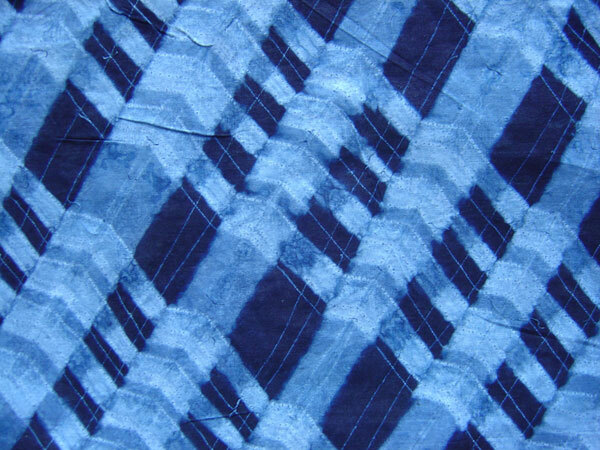 Adire textile is a resist-dyed cloth produced and worn primarily by the Yoruba people of southwestern Nigeria. 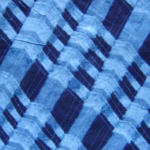 The Yoruba label adire (meaning “tie and dye”) was first applied to indigo-dyed cloth decorated with resist patterns in the early twentieth century. By the second half of the twentieth century, broader color palette of imported synthetic dyes was introduced. Adire then included a variety of hand-dyed textiles using wax-resist batik methods to produce patterned cloth in a dazzling array of dye tints and hues. Adire textile production is assumed to be inborn; inherited by birth and the heritage passed on to descendants of families who were also involved in the production process. In Egba land, the craft was formerly known to be a family business. Parents passed the techniques down to their female children and the wives of their sons. For a long time, people who were not from a certain family were not allowed to partake in Adire production as it was a part of the family’s heritage. The Adire was first produced in Jojola’s compound of Kemta, Abeokuta by Chief Mrs. Miniya Jojolola Soetan, the second Iyalode (Head of Women) of Egba land. She then passed on the process to her children and onward to the future generations. The first Adire material was made with Teru (local white attire) and Elu (local Dye) made from elu leaf which is planted in the Saki area of Oyo state. The 1930s brought with it innovations that allowed men to partake in adire making, which was primarily a female craft. Women remained specialists in the dyeing, tying, hand-painting, and hand-sewing done prior to dyeing, but the men became involved in decorating techniques using stitching machine and applying starch through zinc stencils. By the 1960s a growing availability of chemical dyes from Europe caused a revolution in color and techniques. This, of course, attracted the Nigerian fashion designers who now adapt the designs to print high-quality cloth and have transformed the art of adire into an entrepreneurial craft. This craft can now be taught in institutions. Today, new multi-colored Adire uses simple technology and hot wax or paraffin are used as resist agents in place of the indigenous cassava paste. Designs are created by simple techniques including tie-dye, folding, crumpling, and randomly sprinkling or splashing the hot wax onto a cloth before dyeing. To meet the high demand for adire, stenciling has largely been replaced by a block printing technique to apply the hot wax. Batik is a technique of wax-resist dyeing that originated from Indonesia, and came to West Africa over 100 years ago. It’s possible that batik was brought back by the Belanda Hitam, or “Black Dutchmen,” who were indentured West African soldiers stationed by Dutch in Indonesia. The process of making the Adire batik starts with a careful selection of the best white cotton fabric available on the planet. The fabric is either DE starched or pre-dyed (DE Starch is a process where you wash off starch from the fabric so the wax can be properly absorbed). The fabric is either Pre-dyed or used when DE starched, this ensures that the designs show the white effect when fully produced. The Candle wax is placed in a metal bowl on a stove to dissolve the wax, and the hot wax is used to create patterns on the DE starched or pre-dyed fabric. Designs on the fabrics can either be sketched by hand with a stencil foam or a Foam Stamp is used to create designs on the fabrics. The Foam Stamp are made by creating the Motif on the foam then carving out the desired mold needed. After the fabric has been designed with wax, it is then immersed in a final background color. Then the wax is dissolved by immersing the fabric in hot boiling water. It is the cleansed in clean water and hung to dry. National Batik Day on October 2, the date in 2009 on which UNESCO designated batik as a Masterpiece of Oral and Intangible Heritage of Humanity, raised the awareness and love for batik both in Nigeria and around the world. Design using the Foam Stamp. Freehand design using the stencil foam. These patterns are all produced using the Candle wax. Over time at Adirelounge we have been able to actualize these designs in various colors and patterns. Today, new multi-colored Adire uses simple technology and hot wax or paraffin are used as resist agents in place of the indigenous cassava paste. Designs are created by and randomly sprinkling or splashing the hot wax onto a cloth before dyeing. To meet the high demand for Adire, stenciling has largely been replaced by a block printing technique to apply the hot wax. Whether created by old processes or new innovations, Adire today continues to face fashion challenges and is still an alternative to machine prints. The textile appeals very much to the fashion conscious in Yorubaland, Nigeria, and on a global level.